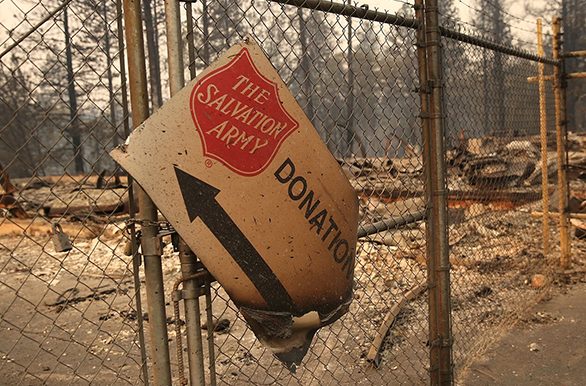 WILDFIRE UPDATES The Salvation Army will be there before, during and after disasters. Learn more about our current response and recovery efforts. The Salvation Army provides emergency relief and long-term recovery assistance to individuals and families affected by disaster, providing immediate deployment of mobile canteens equipped with food, water, and emergency supplies by trained staff and volunteers. Support the Greatest Need Make a gift that will assist neighbors struggling with personal and natural disasters, now and throughout the year. Support Wildfire Relief Make a gift that directly supports evacuees and first responders of California Wildfires. Last year, The Salvation Army served 7,457 meals , 460 snacks , 8,405 bottles of water/beverages , and provided 1,630 articles of clothing and 1,247 N95 respirator masks . 886 households received short-term financial assistance in the form of gift cards or thrift store vouchers totaling $182,390 toward household recovery. Rebuilding the community, residences, and homes will take years and The Salvation Army continues to provide financial assistance and support to all communities, as funding is available, until their needs are met. To date, The Salvation Army has provided long-term financial assistance to over 240 households , totaling $564,629 . The Salvation Army Progressing on Long Term Recovery for SoCal Wildfires To date, 985 individuals have received immediate financial assistance. Malibu Courthouse (23525 Civic Center Way, Malibu, CA 90265) - Monday through Saturday, 10:00 AM to 8:00 PM. Conrad L. Hilton Foundation (30440 Agoura Road, Agoura Hills, CA 91362) - Monday through Saturday, 10:00 AM to 8:00 PM You can send help those affected in Southern California by donating online here . 87¢ of every dollar you donate goes directly to sustaining life-changing programs in the California South Division.